ROAD TOWN, Tortola, VI- Premier and Minister of Finance Dr The Honourable D. Orlando Smith (AL) has always boasted about the relationship that exists between his National Democratic Party (NDP) Government and the United Kingdom Government. 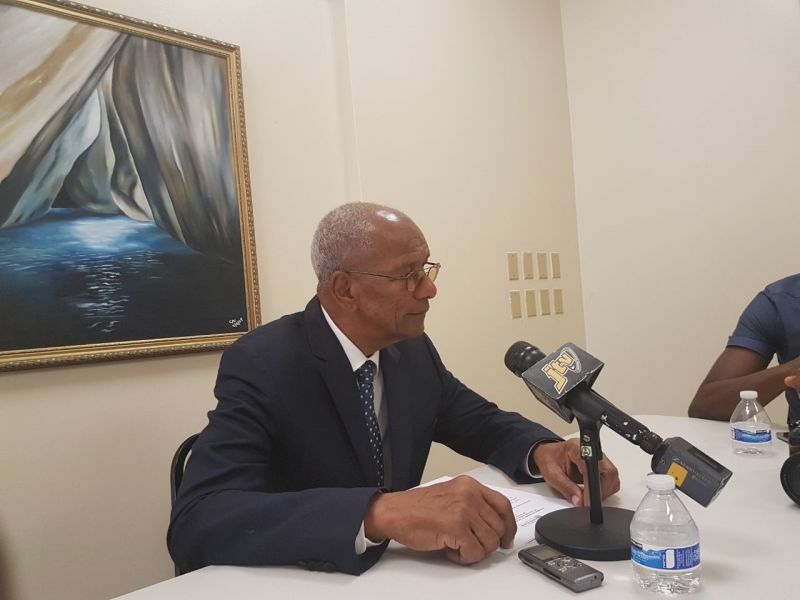 During a press conference at the Office of the Premier today, May 2, 2018, Dr Smith was asked about that relationship following the surprise decision by the UK Government of Theresa M. May on May 1, 2018 to support a Bill brought to the House of Commons by the Opposition to make beneficial owners of offshore companies in the Overseas Territories (OTs) public. A public ownership register could have an adverse impact on the offshore financial sector of the Virgin Islands. And according to Premier Smith, the decision by the UK Government to support the amendment to the Bill, known as the Sanctions and Anti-Money Laundering Bill, “does not speak well about the partnership” that exists between the VI and UK Governments. But Premier Smith reminded that the Bill was put forward by the Opposition and not the UK Government. what’s the plan now Premier? Is it to sell ourselves to the Asians? Is this the next push? We are unprepared to fill the whole no matter how we spin it. Time to pull up our sleeves and get seriously focused on our present and future outlook. Total rubbish. It is the fact that the BVI does not have a single friend in the U.K. that caused this. This was run by Margaret Hodge a quasi communist Egyptian who hates capitalism and Britain and is in the opposition Labour Party not in the government. But constant bad treatment of Brits by the BVI’s Labour, Immigration and Customs and constant un replied to inaccurate stories in the Press of money laundering, drugs, tax evasion etc means we have no friends at all there. The inhumane treatment of non belongers workers after the hurricanes with gestapo like gangs from Immigration hunting down the houses of down islanders did not help either. What goes around comes around. Who controls what bills are brought to the floor of the House of Commons? Did the government of PM Theresa May had to support the legislation? Was the government looking well beyond the vote? Was the government thinking about the UK, not the BVI? Did the UK-BVI relationship factor into the support for the bill? Was the tough talk by some VI residents helpful? Would have more effective diplomacy yield a better outcome? What leverage does the BVI have now? Can the BVI over play its weak hand and make tings worse? Should the BVI be now purposely quick to listen and slow to speak? Lets stop fooling ourselves into believing that the UK has our best interest at heart...stop being so damn simple. This whole fiasco is all about the New World Order. Dr Smith needs to stop living in denial...no matter how nice you try to be be, it will not benefit the Virgin Islands..learn that. The UN Agenda 21 Depopulation Storm will not be changed by soft talk and niceness. Doc if you ain't ready for this give someone else the opportunity to make meaningful changes. The Virgin Islands between a rock and a hard place now...we were properly set up between geo-engineered Irma, the Recovery and Development legislation and this Beneficial Ownership Legislation....a complete recipe for disaster. Imagine these little islands facilitating significantly more in Foreign Direct Investment than the UK. This is the real problem, don't be fooled....Europeans have always been up to no good, the sooner we accept this fact the better our chances of surviving what they have planned for us. Stop selling out your country and people, you too will end up with nothing. I am not sure if I understand the rant here... what I do understand and what I observed was the VIRGIN ISLANDS (UK) being misrepresented by someone who is a Non-elected Government Official... speaking on behalf of the people’s business in a tone of voice that was bewildering/ condescending and displayed a behavior of arrogance, ignorance and feeling a sense of share entitlement! The issue with the government of the day, was, is and always will be, their lack of transparency and open honesty! All first lady’s take a hands off approach in handling government affairs directly! It is their duty to support the husband and do humanitarian work! NOT TO TAKE ON TASKS...That are appointed for ELECTED GOVERNMENT OFFICIALS! I mean Mr. John Cline or even Mr. Willock would have done a better job... since we just randomly sending people to talk on behalf of our country’s business! I resoundingly concur with your position. How many of our 13 elected officials have delcared their interests as mandated by law? Now all those making the loudest noise are he ones fearful that their arses will be exposed. Maybe now we will see which rep owns what companies in what sectors here locally. How many elected reps and their associates have businesses competing with those of us out here? How many of those reps have businesses that are profiting off of BVI Government contracts? Now we will see through proper investigative journalism how the game has been rigged for over 50 years for certain families and individuals!! Level the playing field!!! Legal entities and individuals will still use our services and products - the dodgy companies and persons looking to evade will seek out other jurisdictions that will/are blacklisted. For far too long the fat cats at the top locally have filled their cups over and over; why didn’t these locals encourage government and private sector to invest in training for locals to take up the labour pool locally with a view I having more qualified locals in this sector? Blame cannnot be cast at the USA and U.K. alone look inwardly and you will see the setup. just a question: whatever happened to the harmonious relationship we once had with Great Britain: suddenly the territory is drifting & drifting: which way is up!!!! Name calling and political infighting won't dig this territory out of the hole it is in, it will just dig it deeper. Without the financial support of the UK the BVI will not survive and as much as we deplore the unfair treatment we are receiving from the UK, we need to recognize this is fight we cannot win. There will be no business as usual and the government needs to stop misleading the people and face up to reality, finance is on a rapid decline so we need alternatives to eventually replace it. It is unlikely we will find a single income generator like finance again, but, one industry, tourism could fill a large of the hole that needs to be filled. Tourism requires significant investment so we need outside help, which, will not come under the current regimes carried out by Immigration, Customs and Labour. In the real world these organizations are there to serve the needs of their country and it's people, in the BVI it appears to be the other way around and this will kill the territory if it continues. The task at hand is very simple, change our ways or die. @ wise up...it was just deception...don't get it twisted. Only a bad mother starves, abuses and do not provide for her children. Not that I believe VIlanders are children but some often refer to the UK as the mother country, so what usually happen when a mother abuses her child. If you aren't children and you also can't provide for yourself then what does that make you, perhaps a people without GOOD leadership, a people without foresight now lost to starve without means to provide for themselves, all progress made in the past 20+ years to be destroyed Unless you decide to forge your own path.